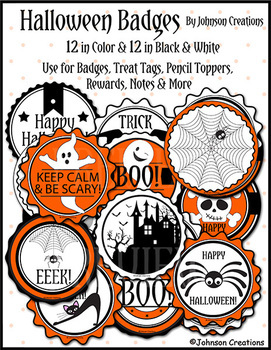 There are 4 sheets of 6 badges- 2 in color and 2 in black and white. Print the black and white sheets on white paper to save ink and have your students color them. You can also print the black and white sheets on orange paper. The badges can be printed in color, too. They can be worn as badges or used as rewards, glued or stapled onto corrected assignments and homework, left on or inside desks as surprises, and used as gift tags, notes or pencil toppers.